This week, Third Window Film release two of Japanese cinema’s most iconic cult movies. Shin’ya Tsukamoto’s Tetsuo: The Iron Man (1989) and Tetsuo II: Body Hammer (1992) – two duel towering monstrosity of heavy metal horror with a fragrant disregard for narrative convention – both ignore traditional cinematic boundaries for an inventive mixture of shocks, gore and balls-to-the-wall eccentricity. The first film, Tetsuo: The Iron Man, opens with a peculiar man known only as the ‘metal fetishist’ inserting scrap metal into in his body. Whilst experimenting with his new mechanical form, a businessman driving his car hits him in the street. However, the ‘metal fetishist’ survives but takes his revenge by infecting the businessman with a disease that sees his flesh and organs rapidly become consumed by metal. The sound of steel scraping against steel can be heard during almost ever action in Tetsuo, regardless of whether it’s a fork against a pan or a woman licking a miniature sausage provocatively. Combined with an industrial score sound-tracking a cavalcade of churning gears and hydraulic pistons, Tetsuo acts to highlight Japan’s increasing dependence on technology in a provocative and deeply harrowing way. Shot in monochrome, the film’s washed out and lifeless aesthetics are in keeping with its subject, presenting a gritty, mechanized narrative that transports you into a realm of mechanical assimilation and a torturous series of unstoppable events. The fear of artificial intelligence becoming self-aware, which was prevalent throughout the early nineties, amalgamates nicely with the surreal imagery of David Lynch’s 1977 noir nightmare Eraserhead and the body horror of David Cronenberg. 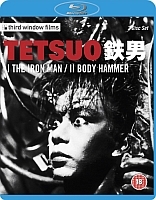 In Tetsuo II: Body Hammer, the ‘Iron Man’ transforms into a cyberkinetic gun after a gang of leather clad gangsters kidnap his son. Less erratic and more conventional, this sequel-of-sorts is slightly reminiscent of Hollywood sci-fi blockbusters of the 1980s, yet Tsukamoto’s fascination with body horror and masculine sexuality remains. Tetsuo II maintains Tsukamoto’s focus on Japanese cultures obsession with shape-changing, using the assimilation of Tokyo from a leafy capital to a mega-metropolis as the central premise behind his central character’s metamorphosis into a gun made of flesh and steel. Together, Tsukamoto’s Tetsuo double bill presents a fascinating insight into Japanese culture, with this graphic Eastern allegory for society’s dependence on technology a surreal, yet powerful metaphor for both the positive and negative influences of our world’s rapid technological advancement. Both are must-see movies for fans of Asian extreme cinema.